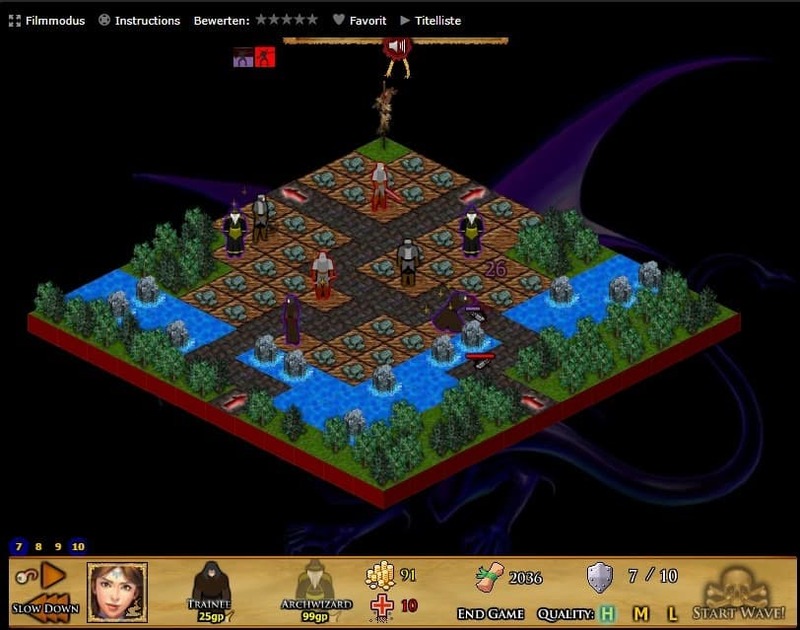 Protector IV is a free online tower defense game in which you follow a main quest and complete side-quests to level up your character and heroes. Each game begins with the creation of the main character. You answer a handful of questions that determine initial bonuses, e.g. magic or ranged combat. You learn later that there are basic skills and talents that your main character may learn or acquire. These skills and talents give bonuses to your heroes and the troops they let you recruit. 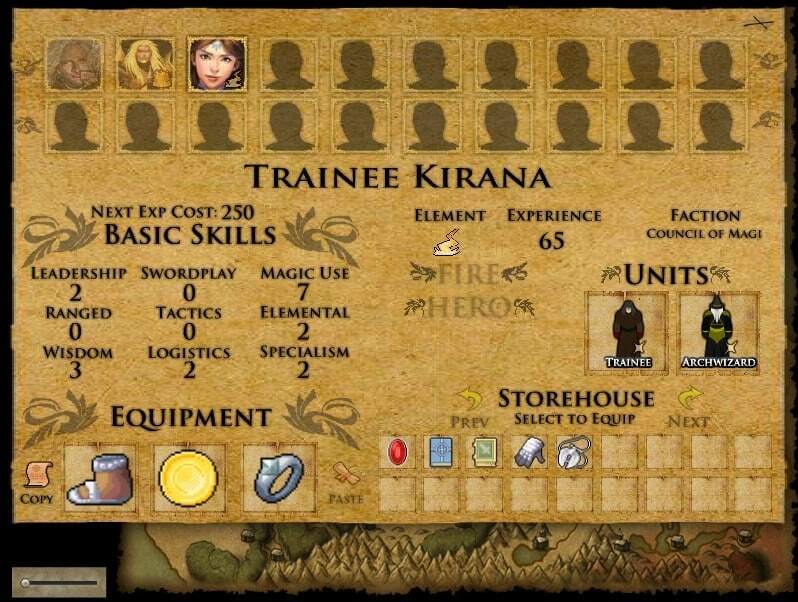 Heroes have basic skills of their own and earn experience that you may invest in skill upgrades. Each hero unlocks the recruiting of two unit types; usually a base unit type like a (mage) trainee and an advanced unit type like arch wizards or paladins. You decide what you want to do next on the map. 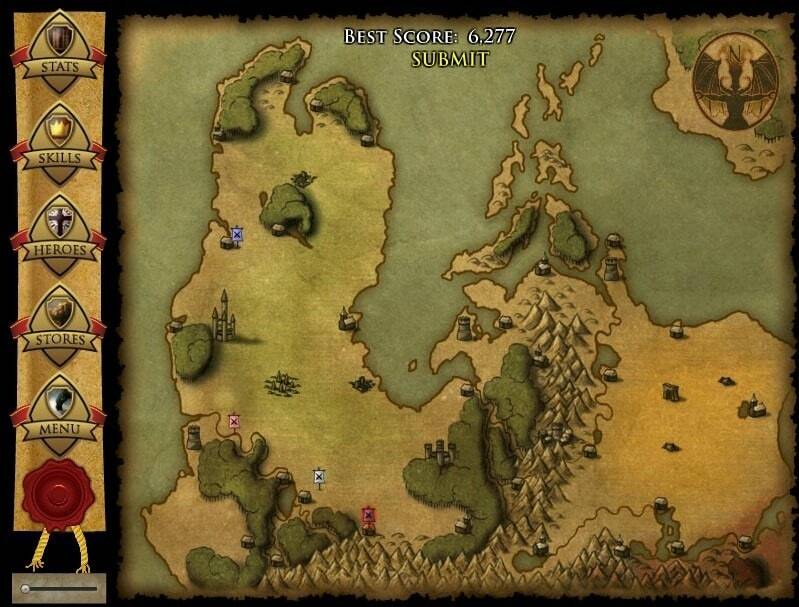 It displays locations for quests and camps. Quests lead to battles that you fight while camps to opportunities to recruit new heroes. You select heroes that you want to participate in battles whenever you select a quest. The screen provides you with information on the upcoming battle; the number of waves, enemies, and strengths and weaknesses of enemies is listed here and you should pick your heroes to counter all enemy types effectively. The map is divided into squares and paths. Red arrows indicate where enemies enter and exit the map, light brown squares where you can place your units if they are cleared already. You have to pay money otherwise to clear them before you can place a unit on the square. Heroes, units that you can place on the map, and information about the battle as well as game controls are listed in a stripe at the bottom of each map. A click on a hero displays all available ones so that you can switch between them. This is not overly comfortable but manageable. The range of each unit is shown when you select it. Melee combat units hit adjacent enemies only while ranged units have a better range. Hover over the wave numbers to display enemy strengths and weaknesses. Some enemies may be strong against melee damage, others weak against magic. You may encounter flying units which your melee units cannot attack at all. Units gain experience during the battle but this is only for that battle. You can spend the experience and money to give them skills that make them more powerful. Your heroes (and you) earn experience after battles even if you lose. It is better to win though as you get more out of the battle. Spend the experience to improve basic skills and become more powerful. You will find items as well which you can assign to heroes to make them more powerful. Is Protector IV a fun game? If you like strategy or tower defense games, then it is certainly fun to play. It can be frustrating at times especially if you don't spend experience to level up your main character and heroes, and don't equip your heroes using the most appropriate items. Game playback and visuals feel a bit old-fashioned when you compare Protector IV to more recent releases such as Kingdom Rush or Cursed Treasure. Make sure you have melee and ranged units in your units pool. A good starting lineup is to have magic, ranged and melee heroes in your initial lineup. Improve the units on the battlefield if possible. You have limited space to place units and money is often invested better in upgrading units. Spend the experience you earn during fights. It is important that you spend the skill points wisely; a melee hero fares better with the "swordplay" than the "magic use" skill. Equip your heroes with items that fit them best. Again, if you have a mage user, you may want to give that hero equipment that improves magic use. Some items, for example those that improve speed are useful to all heroes. You show us people more respect that refuse to play online games by tell us about an offline game as well.